If there is a lesson to be learned from engaging with the looniverse, it must be that there exists nary a phenomenon that has not been the subject matter for a conspiracy theory (no wonder, really, given the human psychological proclivity towards confirmation bias, and the self-affirming nature of conspiracy theories). Among the more outré subject matters is death. Yes, that’s right. The claim that humans die is a conspiracy, or so say believers in transcommunication (they do claim, however, that “research suggests …”). They are here represented by the reliably delusional Tom & Lisa Butler who run the website “Association TransCommunication”. The main phenomenon is EVP, or “electronic voice phenomenon”, the belief that spirits can communicate from "beyond" on electronic audio recording equipment. Practitioners often set up a recording device in a room where it is thought that ghosts reside. The practitioner then asks various questions while recording. Later the tape is analyzed both forward and backwards, searching the "white noise" for anything that might sound like a sentence or word. So, electronic noise is really ghosts trying to communicate with the living. Sort of similar to seeing God when perceiving a face in the clouds – and this serves as “objective evidence” for survival after death. In fact, ATransc actually recommends mucking up sound systems to better hear the voices. A short intro to the phenomenon is here. A (hilarious) instruction guide (this is serious) is here. The Butlers have also written the book “There is No Death and there are No Dead”, which details the history of EVP, gives ample examples, explains how to experiment with both EVP and Video ITC, and explains the Death conspiracy (see also their attempt at defining “objective evidence”). The Butlers are apparently currently the leading experts on the phenomenon after the, uh, death of the founder, the clinically delusional Sarah Estep (the Butlers also set up the Sarah Estep Research Fund). ATransC Publishing has also published Martha Copeland's book, “I'm Still Here”, as an important illustration of how contact with a love done via transcommunication can help with grief [not recommended in general, I think]. This book represents the formation and purpose of The Big Circle, which began when members gathered around Martha and Karen Mossey to record for EVP on a regular basis so that they could use the group energy to continue their relationship with loved ones now on the other side. They have also released the video “White Noise”. Diagnosis: Pure, unmitigated crankery runs rampant with the delusional Butlers. They seem to have a solid fan-base, but are probably not very dangerous. This entry also indicts their associates Becky Estep and Karen Mossey. It also indicts Martha Copeland who got drawn into the mess after the tragic death of her daughter, who she still claims to have contact with (she needs psychiatric help, in other words). Somehow I managed to miss Mark Chu Carrol's visit to the Butlers here. It's rather good. 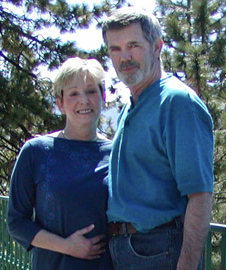 I am with Suzyrain, I personally know Tom & Lisa and have been going to the church they run. They are very nice people and I have seen and heard many EVP's myself. I do believe on the other side and I do believe their work has changed the way we communicate with the other side.